Women In Tech: Is It OK To Say "Guys"? Is it OK to use the word “Guys” when addressing a mixed gender group of colleagues? Should women celebrate their feminine qualities or seek to avoid those stereotypes entirely at work? 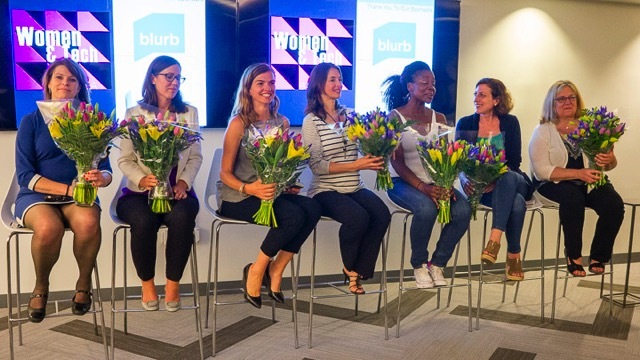 These were some of the things discussed at a recent event, “The Gender Gap and How to Defeat It,” organized by Thomson Reuters and hosted by Blurb, a self—publishing startup in San Francisco. It featured a panel of younger and older women working in the tech sector and primarily aimed at an audience of young women students preparing to enter the workplace. The panelists represented a wide range of experiences of women in tech: Sarah Granger, author and consultant; Rachael O’Meara, sales executive at Google; Judith Basler, Director of Project Management at Blurb; Marine Leroux Thibault, Head of User Experience Design at Thomson Reuters; Donna Boyer, Director of Product at Airbnb; Nono Guimbi, Senior Software Engineer at Jawbone; Kelly Currier, Director Agile Delivery at Salesforce; Nancy Dickenson, consultant. More information on the speakers is here. - Women can manage teams of programmers without having to be coders themselves, said one of the panelists. But they do need to have some knowledge of the technology in order to give the right support to the engineers. - Women managers tend to look at the psychology of the teams and how to ensure everyone works well together. Some try to “be human” and bring feminine values into the workplace. But this doesn’t mean you have to bring home-baked cookies to the office or feel pressure to clean up after meetings, etc. Don’t reinforce stereotypes. A woman in the audience said she did not want feminine qualities in the workplace and said she felt pressure to fulfill some of the social stereotypes. - Just by being the only women in a room can change things for the better. Be authentic. - Fear was discussed. There were stories of overcoming self-doubt and succeeding. Am I good enough? Do I measure up? Often, women will only apply for a job if they think they fulfill all the qualifications. Advice: Look at the job description as a wish list and still apply for the job (men will apply for jobs when they meet just 60% of the qualifications). - Some panelists wished for more feedback and mentoring when they were younger because it would have helped their careers and avoid common mistakes. - Recognition is important but women should ask for power in the workplace as they progress in their careers because that means they will be able to get things done, such as hire more women. Nothing will change unless you make the change happen and for that you need power. - Ask for help. You don’t have to know all the answers at work. Trust yourself. - Women who aren’t software engineers can still work in the tech industry in jobs such as product managers, leading teams of specialists. They are good with people. - A man asked, what are the expectations of men in the workplace? He was told to listen, to take part in the conversation over gender inequality. And to watch language at work. An audience member objected to the word “Guys” when used at work and referring to a mixed group. - There has to be more women to choose from in the hiring pool because startups want to hire the best they can find regardless of gender. - A frustration with slow progress. Dialog on workplace issues is not enough, there must be a concerted push for narrowing the gender gap otherwise change will be too slow. It was an excellent panel discussion and I almost felt like a fly on the wall and listening to a frank discussion between the panelists and the audience on the issues they face as women in the workplace and how they can best support each other.